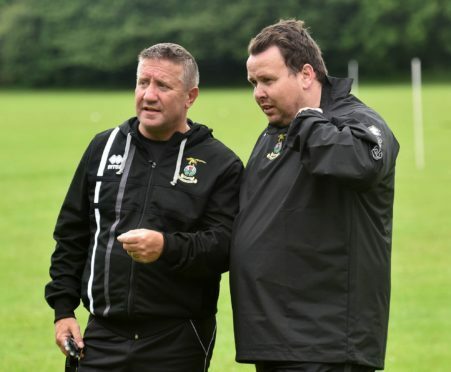 Scott Kellacher (right) with Caley Thistle manager John Robertson. Scott Kellacher believes his promotion to assistant manager shows Caley Thistle want to give opportunities to their own local talent. After the departure of Brian Rice to St Mirren, manager John Robertson offered Inverness-born Kellacher the opportunity to be his new number two and he gladly accepted. Kellacher has worked his way through the coaching ranks at the club, starting out in the community department before moving into the youth set-up and the under-20s. He worked with the first team under Terry Butcher and the following three managers have kept him on. The former Highland League striker is relishing the chance to get going and will take the Caley Jags side which heads to Forres Mechanics tonight. He said: “The likes of Liam Polworth and Ryan Christie have come through the system as players. I have done that in a coaching sense, from starting out with the community team. It gives people hope as to what you can do as a coach as well. “I don’t see my role changing. I worked closely with Brian Rice and John Hughes and had a good taste of it. John spoke to me the day after Brian left and asked if I wanted to do it. I’ve known John for 15 years and we’ve kept in touch, so when he offered me the job I thought ‘absolutely, let’s go’. As part of the coaching reshuffle, former players Ryan Esson and Barry Wilson will join Robertson’s staff. Esson will continue as goalkeeping coach and Wilson will work with the first team, with both sharing duties with the new under-18 side. It is the latest development in Kellacher’s career, with one eye on management in the future. Kellacher added: “One day it would be nice to but I’m in no hurry. I’m looking to get experience as an assistant and learn off John.